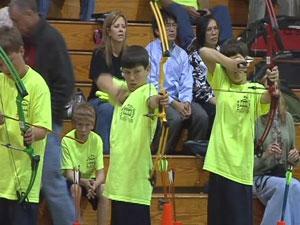 Some youngsters were trying to get on target this morning at the First Baptist Church Activity Center in Wilmington. The Roger Bacon Academy archery team competed to qualify for the national tournament The team’s scores were digitally sent to Raleigh to be compared to other teams also competing today to determine the team to compete at a national tournament. Eighth grader Hunter Johnson started practicing when he was only seven years old. He is now ranked second in the world and says archery has been an incredible experience. Johnson also said that archery has shown him leadership skills and determination and that his grades have improved, making him want to do the best he can. He said it is a great sport for anyone looking to get involved.